Last week the Northglenn High School’s entrepreneurship presentations aimed at creating small business opportunities which have an impact on the local community — all with the aim of reproducing this initiative here in Broomfield. Northglenn is known locally for its progressive programs including STEM, a curriculum based on the idea of educating students in four specific disciplines — science, technology, engineering and mathematics — in an interdisciplinary and applied approach. To some extent the entrepreneurial ideas presented are an extension of the STEM ideology, integrating various disciplines into a cohesive learning paradigm based on real-world business ideas. Central to each of the business concepts was the involvement of students, the utilization of existing resources at the school, and engagement with the Northglenn community. Several of the presentations revolved around hydroponics and food production from the school’s greenhouse, potentially serving both the school itself and the local community. Most encouraging was the fact that most of the ideas could be realized with little capital expenditure and within a relatively short time frame. Obviously none of this would be possible without a dedicated team of teachers who juggle busy teaching schedules and other responsibilities between their family, classrooms, and personal time. To quote Daniel Morris, the organizational talent behind this initiative, the teachers, “did a great job outlining their goals, representing the commitment to their community and personal growth through working together as a team”. Hopefully Northglenn High School will carry some of these ideas through to fruition and we as an economic development community will continue to support them through connections, introductions, and other general input. It should also be kept in mind that this concept is transferable, helped by connecting our local business community with our schools, an ideal that the Access Broomfield Economic Coalition hopes to propagate. We intend to create a culture of entrepreneurship here in Broomfield, encouraging young talent and creating an environment that fosters innovation and eventually new jobs and investment in our community. 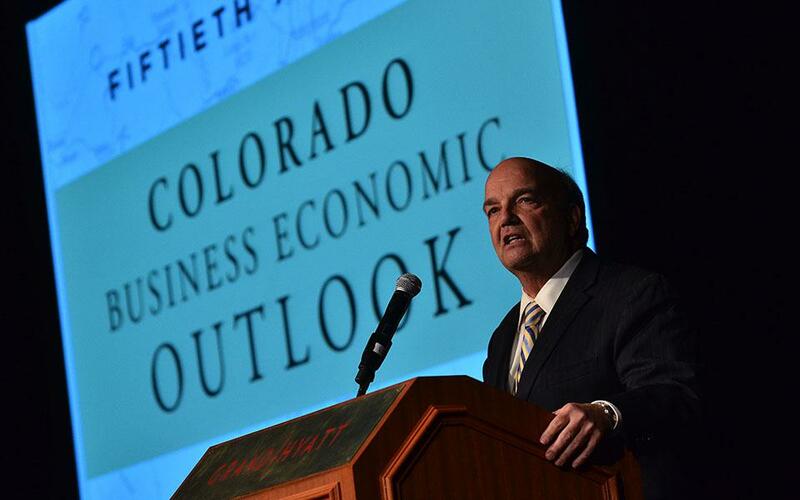 On Monday December 5th, the Leeds School of Business hosted its fifty-second annual Colorado Business Economic Outlook for 2017. Held at the Grand Hyatt in Denver, the free event attracted a large audience with standing room only for the economic forecast presented by Richard Wobbekind, Executive Director of the Business Research Division at the University of Colorado and Kelly Brough, President and CEO of the Denver Metro Chamber. Although spearheaded by CU, the Economic Outlook has input from 100 individuals from the business, education, and government communities who serve on 13 sector estimating groups. Referencing 2015 Bureau of Labor Statistics, Colorado continues to rank in the top ten states for real GDP and employment growth but personal income growth continues to lag, a reoccurring concern for the State. The Colorado resident labor force is forecast to reach 2.96 million in 2017, while the State unemployment rate is forecast to increase from 3.5% to 3.9% due to job creation lagging behind labor force growth. Total non-agricultural wage and salary employment is forecast to reach 2.66 million in 2017, up from 2.6 million in 2017. Colorado is anticipated to add 63,400 jobs (2.4 percent growth) in 2017 as demand for goods and services continues. The squeeze on housing looks to continue as homes simply can’t be built fast enough to keep up with household formation which in turn leads to price escalation. Millennials (16-36) and Baby Boomers (70+) are two important groups as the former look to make first home purchases and the later look to downsize. Although Colorado’s population growth is anticipated to slow, the north Front Range (Broomfield included) is forecast as having the fastest growth between 2015 and 2020 with an annual average increase of 2.6% or 85,000 new residents. One important element that was outlined in the presentation is the importance of new businesses to overall economic growth. New businesses tend to create more jobs, grow faster while being responsible for greater innovation and overall productivity than older businesses. Colorado boasts the seventh highest concentration of young firms in the country, with 36.2% of all business five years and younger. Were it not for this constant supply of new businesses the Colorado economy would lose jobs in most years. This impressive high rate of entrepreneurship and new business formation is attributed to “a culture and population of risk-taking individuals, as well as a business climate that supports new businesses and a diverse base of growing industries”. Favorable age demographics and existing expertise in the State are also contributing factors. Industries with science, technology, engineering, and mathematics (STEM), referred to as “high-technology” industries are the mainstay of this new business activity. According to the Colorado Business Outlook, there will be ongoing challenges for farmers and ranchers in 2017 as they face significantly less income with roughly the same expenses. Diversification might offer a solution were it not for the challenge of insufficient water. Established operations should see a better economic climate if they can weather the next couple of years. After a particularly difficult time for the Oil and Gas industry with a 25% reduction in 2016, the industry is anticipated to make further modest cuts in 2017 primarily due to continued depressed prices. However, with a new Republican president and a Republican Congress few anticipate any legislative impediments to the growth of this industry in the United States. It will come as no surprise that 2016 marked the busiest year in construction activity in Colorado’s recent history. Of interest for 2017 and alluded to earlier in this blog, will be the switch from apartment construction to Single-family housing. Another likely construction focus will be schools, apparently responsible for 70% of requests on Novembers ballot. Employment in this sector is expected to increase by 5.7% in 2017. A $23 billion industry in Colorado, Manufacturing represents about 7.3% of the state’s GDP. The industry is anticipated to grow in 2017 which will mark the seventh consecutive year of growth. Employment is estimated to increase by approximately 1.6% with 2,300 jobs being added. Growth is expected in all sub-sectors with the exception of fabricated metals and computer and electronics. Employing nearly one-fifth of Colorado workers, this sector is is the largest provider of jobs in the State. This industry includes wholesale trade, retail trade, utilities, warehousing, and multiple facets of transportation (air, truck, transit, rail, pipeline, etc). In 2017, the sector is expected to grow another 1.6% exceeding 461,800 jobs. The information sector has realized some of the fastest, long-term growth of any sector in the Colorado economy. Even with losses in publishing and telecom the industry is expected to grow by 1,100 jobs in 2017. Growth in film, broadcasting and data processing have offset publishing with Colorado’s Film Television and Media incentives in particular having brought dividends. Made up of Finance, Insurance, Real Estate, Rental and Leasing, this sector has been experiencing continued growth in Colorado since 2012. And although encountering a moderate slowdown in 2016, the sector is expected to increase by 5,300 jobs in 2017 to a total of 169,400 buoyed by an improvement of the overall economy. Nearly 16% or 406,000 of Colorado’s total employment fall into this category with a further 7,000 jobs projected to be added in 2017, the vast majority of which will be in Professional, Scientific, and Technical Services. A key industry in Colorado, the Leisure and Hospitality industry accounts for more than one in eight jobs in the State and has seen consecutive employment growth over the last seven years. Employment growth in this sector is anticipated to continue in 2017, increasing by 12,000 jobs or 3.7%.